A few mornings ago when I checked, the roots on this one had started. Ten or twelve little white points poking through. I shook my head in amazement, which I do just about every time I see this happen, as though I haven’t yet realized that I can count on it. And then I had this thought: Earthly organisms have instincts. 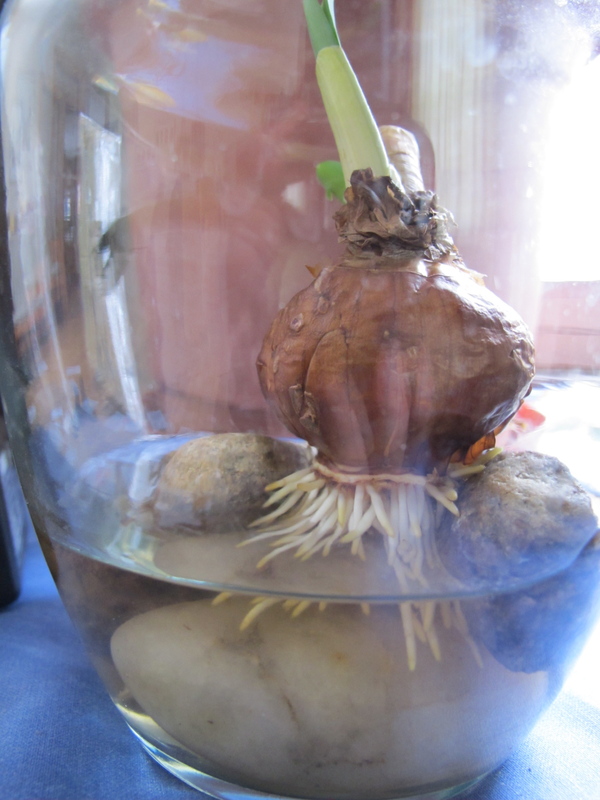 Complex and specific indeed, this tendency of a bulb to send out roots just because water is nearby. What about other earthly organisms? We often say to each other – we humans who do have reason on hand – “trust your instincts!” But we also don’t tend to trust our instincts much at all, particularly in the industrialized pockets of the planet we inhabit. We favor reason. And we trust a cocktail of experience and interpretation of experience that relieves us of the need to trust instinct. Or at least makes us feel like we can get away with not trusting our instincts. I think this is fairly costly, and could be in part to blame for much of our disease and unrest. Where it may be most costly is in how we inflict the bias on young people. Human children have instincts about which activities and tasks they’re suited to and which they are not, and they immediately start acting according to those instincts. If they’re wordy, they might crawl in the direction of books, or listen especially intently when others are talking, or not start speaking until they have full sentences ready. If they’re outdoorsy, they might cry when it’s time to go inside. If they’re fascinated by structure, they might pile things up and knock them over, and then repeat. And if they’re not wordy, and someone’s trying to push words at them, they might duck or squirm. If they’re not outdoorsy, they might cry when it’s time to go out. If they’re not fascinated by structure, they might ignore the blocks. The very thing that makes a young human child delightful, the instinct that makes her perfectly suited to life on earth, also sets spinning the worrisome wheels of the reason-driven adults who are charged with her care. We start forcing reason on kids when they are very, very young in the form of various curricula. (Where a curriculum is any pre-determined course of instruction or expectation, mandated according to reason.) We have curricula for walking, for eating, for sleeping at particular hours, for behaving in specific ways under specific circumstances, for understanding lists of things and performing lists of tasks we’ve heard are critical to development and success. And we have reasons for choosing the curricula we choose. Very often our reasons are good. But kids have lots of good instincts, too, and while it’s not always clear what those instincts are for, what the “complex and specific” nature of the instinct is and what pattern or journey it might lay the groundwork for, if we could find the courage to try to choregraph a duet between the two – between our reasoned relationship to the world and the instinctual nature of the creature new to its environment, we may very well find ourselves delighted and amazed, relieved even, by what becomes possible.